Wouldn’t it be great to have a dinner party where you did all the decorations with ribbon scraps! How many of us have a box full of ribbon scraps just sitting there collecting dust? Here’s an excellent way to get the most use out of them. Invite a bunch of friends over for dinner! So, what does this dinner have to do with ribbon scraps? No dinner party is complete without decorations to match the theme. Whether it be casual or formal, here are some great ways to not only use your ribbons but also to throw the party of the year! And think of the endless possibilities for those decorations! Starting with decorations for the dinner table, what about creating wine tags from ribbons? You can also tie ribbons around glass stems or around the base of a glass to make a unique look. You can match the color specifically to your theme. Or, make them all different colors for each guest attending. Decorate your place settings with pretty ribbon scraps wrapped around the napkins or silverware. Custom ribbon rolls are perfect for this idea! Choose ribbons with specific dates or sayings on them to match the rest of your decor. Another great idea is to use ribbon scraps to create special and unique invitation cards! Simply glue them onto a themed card to invite all of your guests. Creative cards are sure to secure that your invitations get noticed! 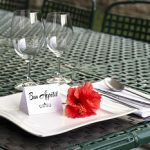 And, they are an excellent way to make a guest feel special and want to attend your social event. Once your guests arrive, make sure they feel wanted with a quick gift for them. 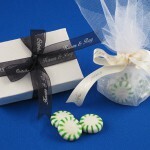 Your ribbon scraps can be used to decorate little bags or boxes with a thank you gift. 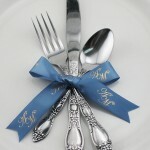 Or tie a ribbon around something that matches your theme that each guest can take home with them. Don’t forget the decorations around the room! From ribbon curtains to creative lampshades decorated with your ribbons, these ideas are endless.